No doubt asking for it… | Pick Me Up Some Mets! I’m not sure how long I’ll leave this post up, but since it’s my place to dish about what I want to, I’ma gonna make a response. "This is a RHETORICAL question–but when I’m at the pub watching the Mets/Yankees games, why do fans of both teams ask me to take my top off? Because Mets fans? That won’t help them win. And Yankees fans? Dream on." The response this female blogger gave me was that I "set female fans back 30 years." Uh oh! I mentioned the very real fact that sometimes as a female fan, you get catcallled. And then I made a joke about it! In my opinion, it’d be more of a setback for female fans if we pretended that obnoxious male fans don’t exist. Thankfully, they’re quite few in number. For this I am grateful. But so far every time I’ve retorted back to an overanxious guy with a quick, witty comment, I’ve been subsequently left alone. I think if I had lectured, showed offense, or moved to another location, etc. etc., that’d be seen by the obnoxious guy as a "win" for them. Not as a "lesson." However, if that’s what a woman in that situation wants to do? Go for it. More power to her. I’ll support however any female fan wants to react in an unfortunate situation that just sometimes happens. And by the way? I love my pink hat. I also have a dark blue one. 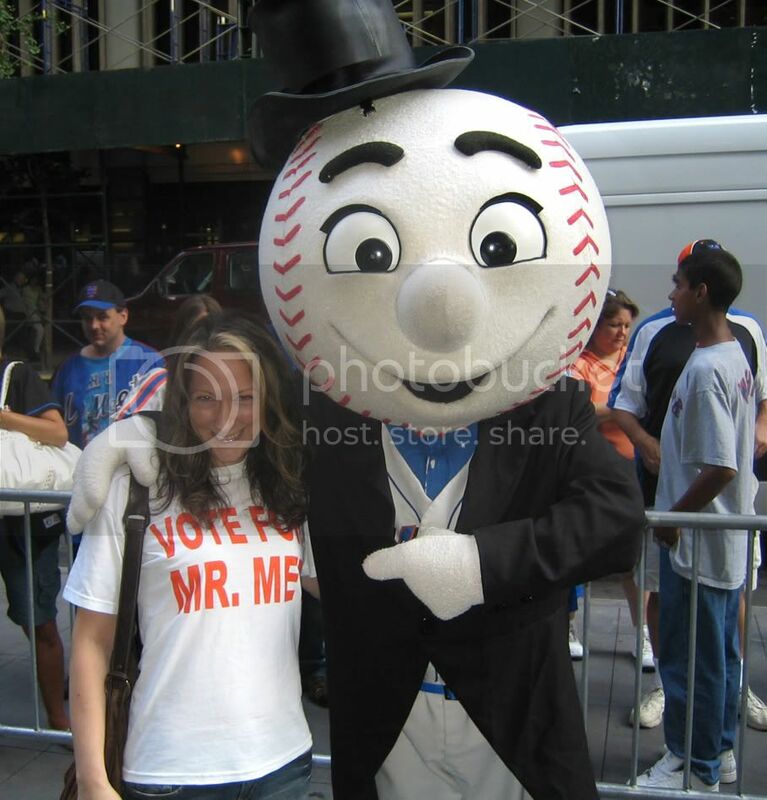 I have a regular blue colored Mets t-shirt and a baby blue one. And I feel anyone who disdains my pink gear should start worrying about their own selves. More than anything, what have we women fans gotten in the past 30 years? Choices. Good post! Stick to your guns!!! Nothing like shame to shut a guy up forever. I deleted my comment on my site before you even responded because I felt it was too harsh. But, as a woman who grew up around men who never took my love of baseball seriously and treated me like nothing but ‘a girl’…and as a blogger who is inundated with emails from men telling me ‘women know nothing about baseball’, I still believe that your comment, placed where it was on my blog, came across sounding like a ‘stereotypical girl fan’ and I since I still fight those obtuse folks on my own blog, I chose to take out the comment rather than have the trolls coming back to say “see, we told you ‘chicks’ don’t know anything about baseball”. In the context of your own blog, it’s totally different. And Cyn, I *totally* support your right to delete a comment on your own blog. Thanks for the note! Nice post Zoe… and I dug your Floyd poem from the other day. Hopefully Cliff can put a hurt on the Yanks tonight. And those pink hats are cool! Let’s Go Mets! Shake it off and show us what you got!